UPDATE March 14, 2019. The Planning Board Approves Regency Center's application. Rejects our request for NO waiver. When it rains, the water hits the ground, the pavement, the roof tops, driveways, parking lots, etc. Some of it soaks into the ground (infiltrates) and some of runs off the impervious surfaces into the storm drain system - down gutters, into storm drain pipes, finally ending up in our waterways through outfall pipes. Too much stormwater run-off in our rivers and creeks causes flooding, erosion, increased pollution, loss of habitat and degradation of the waterway banks. The goal of stormwater management is to keep rain water run-off from polluting our waterways, causing flooding and to get it back into the ground. And because stormwater picks up so much pollution as it travels down the impervious surfaces on its way to the creeks or rivers, it is covered by the Clean Water Act. All States are required to have stormwater management regulations in place to prevent polluted stormwater from fouling our waterways. Local governments must mandate the use of stormwater controls that filter out pollutants and/or prevent pollution by controlling it at its source. Run-off must be captured, slowed and treated by stormwater best management practices (BMPs). In Montgomery County, all stormwater must be treated on-site. The law says that builders and developers must come up with a stormwater plan that uses green methods, usually involving native plants, for getting the water back into the ground. The specific goal is to manage stormwater run-off so that it mimics a site’s pre-development hydrology by using design techniques that infiltrate and evaporate runoff. We call these design techniques Environmental Site Design or ESD. They allow the rain water to soak into the ground where it is cleaned by the bacteria that live in the soil and where it recharges the groundwater. Some popular ESD techniques include rain gardens (also called bioretentions), swales, dry wells and pervious pavement. Rain gardens and swales can serve two purposes - they control stormwater and they are also beautiful landscaping features. However, the State and Montgomery County also recognize that not all areas can support environmental site design - maybe the soil is solid clay or there are underground utilities in the way of digging gardens. So, they state that the ESD must be done to the Maximum Extent Practicable - or ESD to the MEP. The Maximum Extent Practicable is not just a judgement call by the developer, but a standard defined by the State of Maryland. Developers have to submit their stormwater management plans to the Department of Permitting Services (DPS). If they say that they cannot treat all the stormwater on-site with ESD, they must have a justification. DPS will review the plan and the justification before issuing a permit. Developers may be sent back to the design phase if DPS feels that more ESD can be done. Why is ESD to the MEP so Important? Urban areas are becoming more and more impervious. The residential areas in the Little Falls watershed are about 60% impervious. And as homes are rebuilt and new housing fills in empty lots, the impervious cover increases. Commercials centers in the watershed are even more impervious. The Westwood shopping center is 94% pavement and buildings - that mean there is only 6% natural areas to soak up the rain water. 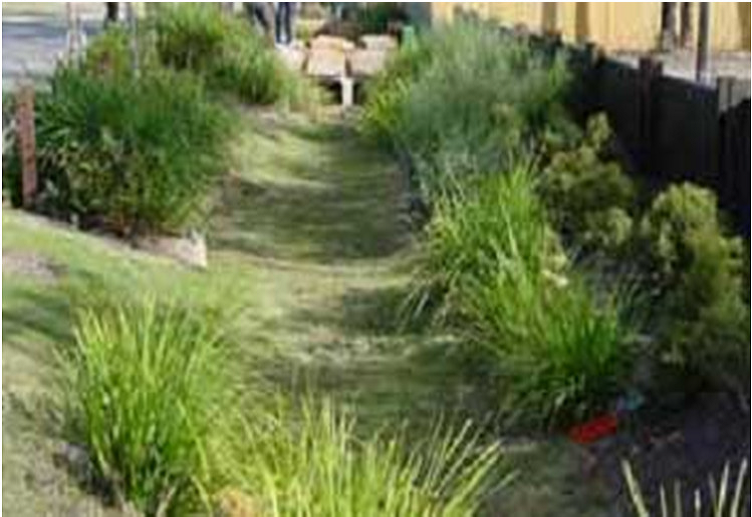 Without stormwater management, 94% of the water runs directly into the creek when it rains. That's a lot of water for the little creeks to process and a lot of pollution. The LIttle Falls Branch is one of the most impaired streams in Montgomery County. The new Willett Branch could suffer the same fate if stormwater is allowed to discharge into the creek when ever it rains. The volume and velocity of the rain water would certainly compromise the new creek. Hence the need for ESD. ESD to the MEP prevents flooding. Water is captured by rain gardens, swales or other design features instead of flooding out parking lots, creeks and even basements The devastating flooding in Ellicott City caused by heavy rains coupled with no stormwater management points to the importance of getting the water into the ground. ESD to the MEP prevents creek erosion. By diverting the rain water run-off to the ESD, the water is prevented from entering the creek where it overflows the banks and causes erosion. ESD to the MEP recharges the groundwater. ESD techniques allow rain water to soak back into the ground where it enters the water table. Plants depend on a robust water table during times of drought, and ground water is necessary to keep our creeks flowing in dry months. ESD to the MEP cleans pollutants out of the rain water. When water soaks into the ground, the bacteria in the soil clean the pollutants. This is why springs and wells are usually potable. This clean water also feeds our creeks. Environmental Site Design uses green techniques to manage the stormwater, so they can be incorporated into landscaping plans. It is good for protecting our waterways and adds plants, trees, grasses and flowers to development. Win - Win. Two exciting things are happening in the Westbard Sector of the Little Falls watershed - the Willett Branch is to be naturalized and the 29 acres of land around the creek including the Westwood Shopping Center, Manor Care and the Westwood II Center is to be redeveloped. A robust stormwater plan will recharge the groundwater and create the baseflow that the new creek needs to thrive. The creation of a new park in this residential/commercial area will provide a much needed green oasis for both the residents of the new development and existing households. Unfortunately, the Regency Centers' proposed stormwater plan for their new development does not include a lot of infiltration ESD, but instead relies on fee-in-lieu waivers and structural storage tanks to manage the stormwater. ESD techniques are only 47% percent of their plan and most of this ESD is green roof, a green technique that provides no infiltration. Green roofs keep the stormwater out of the creek by using on the roof tops, but doesn't return it to the ground. In fact, any water that isn't used on the roof top flows into the storm drain system and goes to the creek. In December, 2018, Little Falls Watershed Alliance hired Designgreen to study the Westbard area, the needs of the new creek and the stormwater management plan proposed by Regency Centers with the goal of determining if - the creek would benefit from more ESD and to if Regency Centers was doing ESD to the MEP. That there were many opportunities for more ESD on the Regency Centers site - in fact Designgreen concluded that Regency Centers could manage all the stormwater on-site by just incorporating a few additional ESD techniques like permeable pavers and Silva Cells for the trees. It is LFWA's position that Regency Centers has not met its requirement to meet ESD to the MEP. 100% stormwater treatment with ESD. Dry wells to capture the run-off from roof tops. Swales to treat the run-off from the Kenwood Condos parking lot and road. The development goes to the Planning Board on March 14, so the time for comments is now. Please join us in demanding the best stormwater plan for our watershed and for our new creek. You can send a email from our website HERE. Information about the new development is HERE. If you would like a copy of the Designgreen report, please email Sarah Morse at Stormwater@lfwa.org. We are happy to share it with you. Swales are long infiltration basins, designed to manage water runoff, filter pollutants, and increase rainwater infiltration. Permeable pavers are special bricks or other materials that allow the movement of stormwater through their surface and into the ground below. They can be used for sidewalks, parking lots and streets. In addition to reducing runoff, they effectively traps suspended solids and filters pollutants from the water. Silva Cells are a suspended pavement system for containing unlimited amounts of healthy soil beneath paving while supporting traffic loads and accommodating surrounding utilities. Rain water penetrates the pavement soaks into the soil around the trees.